Adrian Beovides, the only resident teenage boy of 13-year-old of a town in Asturias, Spain. He has given weird respond during the interview: he does not want another kid in his village. The village has no kids of his age since 2005. 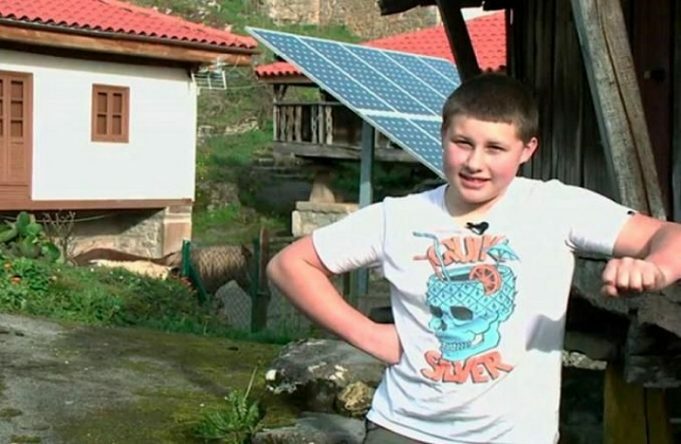 Spanish program interviewed a 13-year-old boy, Adrian Beovides, the only young resident of a town in Asturias, Spain, and his overwhelming responses about the way of life that has surprised thousands of Internet users. He feels very comfortable being the only teenager and, in fact, the teenage resident of a whole town in Asturias, Spain. We are talking about Adrian Beovides, a 13-year-old boy who has captured the attention of many media in the world, after his overwhelming answers to the question of whether he would like other children of his age in his community. The teenager was interviewed by the Spanish program La Sexta Columna, who decided to talk with him to find out what he thought about being the only young resident in the Asturian town of Yernes and Tameza. “I’m very comfortable alone, without anyone touching my balls,” the teenager replied in the program, after being asked if he would not like other kids of his age in his town. According to the report of the program, entitled “Viejennials: the new tribe,” where he tackled the aging of the Spanish rural population, in Yernes and Tameza, where Adrian lives, no children are born since 2005. “Here there is no youth because life here is hard and then the youth wants to have a free day, vacations, and here young people does not exist much. They are the same every day,” said an adult resident of the place. When asked who he is, then, his best friend, Adrian Beovides answered immediately that his best friend and company is his dog. He also explained what his daily routine is when he returns from studying. “Like, I take the tractor and we’re going to throw the cuchu (dung) of my father. Then I go with the dog to the cows. I do not play anything,” he said. The child’s responses unleashed great controversy in the networks, about the unusual lifestyle of these communities where the majority of the population is adult. A really interesting case that has been around the world. How would you feel if you were in Adrian’s position?